A tough one, which often confronts those of us in the transformation business. Here’s what I’ve learned. You have to cull the bozos. Be fair, be humane. Provide fair and generous severance packages, help them find other jobs and so on, all in the spirit of decency. How come there are so many bozos around here? Did we hire them? If so, what’s wrong with our recruitment processes? Did we create them? If so, what’s wrong with our development and appraisal processes, and our culture? The latter is especially tough. It means we may have let people down. 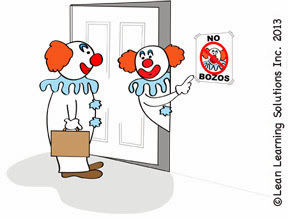 Why did we promote so many bozos? What’s wrong with our succession planning? Here’s a tough reflection point. We have a responsibility to hire good people, develop, involve and motivate them to be ‘the best they can be’. If our organization is full of bozos, we’ve failed on every count.